Volunteers provide valuable support to Nottingham Bikeworks. You will have the opportunity to get involved in our bike community workshop’s activities; meet new people, gain new skills; and discover more about bikes. There are so many ways to get involved with Nottingham Bikeworks as a volunteer. See the available opportunities and read about different types of volunteering. Bike refurbishment volunteer – Help refurbish and tune-up second-hand bikes for sale. 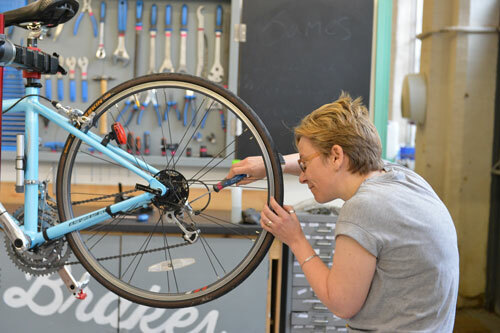 Open Workshop Mechanic Assistant & Teaching Assistant volunteer – Work with courses attendees and open workshop customers to assist them in bike maintenance tasks and create a supportive and encouraging atmosphere. Events volunteer– Increase our programme of non-workshop activities (including fundraising events) and ensure we have a presence at relevant local events. Communication volunteer – Communicate the events and mission of Nottingham Bikeworks via all the media and channels available, e.g. print, digital, social. Shop & Workshop volunteer – Help make the NBW shop and workshop even more amazing. Tasks range from greeting and serving customers to researching and recommending parts and making workshop improvements and renovations. For more information or to apply please contact admin@nottinghambikeworks.org.uk . Please specify which area of volunteering interests you from the options provided above. If your application is successful you will be invited to join us for the soonest induction session.